Rationalist Judaism: How Frum Is Your Food? How frum is your food? Does it have a good hechsher? Does it have the best hechsher? What exactly are the kashrus organizations certifying? While researching the Chicken Wars and other topics for the Feast of Exotic Curiosities, I discovered some pretty disturbing things about the poultry industry. For example, contemporary broiler chickens have been selectively bred to grow as fat and as fast as possible on as little food as possible, so that they can be slaughtered at around seven weeks of age. 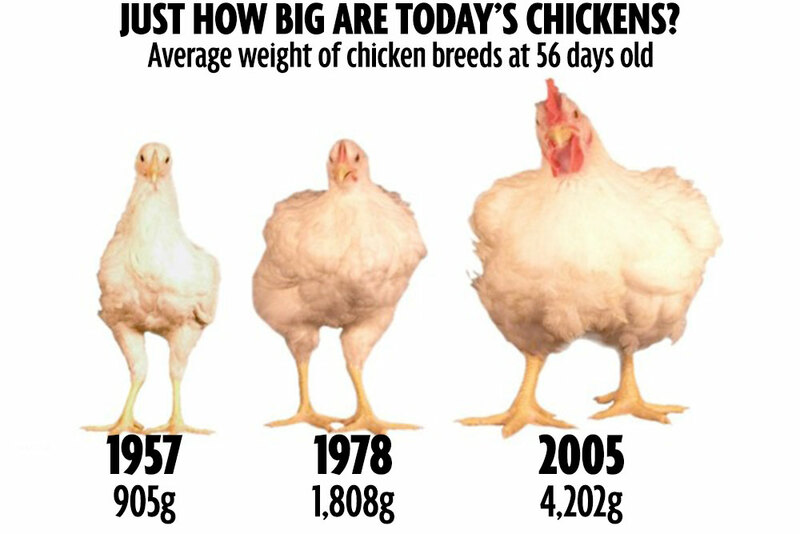 But this is not how God/nature designed chickens to develop; it does not allow their bodies to develop properly. If humans grew as fat as fast as a modern chicken, a 6.6 pound human baby would, in two months, reach a weight of 660 pounds! With chickens, the problems of such extreme growth include skeletal malformation and dysfunction, skin and eye lesions, and congestive heart conditions. It's not a matter of giving them more space to roam; in any case, it is too painful for them to walk. It's the very type of artificial chicken that's the problem. Chickens that are raised as egg-layers suffer a different set of problems. Male chicks, which are useless, are culled; while some practices decried as ghastly are actually painless (such as putting them in a specialized high-speed grinding machine), others, such as suffocation, are certainly problematic. The females have their beaks cut off so that they do not attack each other in the crowded conditions under which they are raised, a surgery which is likely to cause acute and chronic pain. Now, some of the problems with factory farming may indeed cause actual halachic problems with the kashrus of the creature, such as rendering it a treifah (mortally unwell). But, for the purposes of this post, let us assume that there are no actual technical kashrus problems. But what about the halachos of tzaar baalei chaim? There are countless laws in the Torah which teach us sensitivity to animals, including in the laws of kashrut. On the other hand, there is a principle that tzaar baalei chaim is permitted in the case of benefit to man. But does the economic benefit of cheaper chickens count as sufficient reason to cause them great pain? While some halachic authorities are of the view that economic benefit does indeed justify causing pain to animals, others are of the opinion that minor benefits and financial benefits do not warrant causing severe pain to animals. So, what do you do with a situation which according to some halachic authorities is permissible albeit unfortunate, while according to some halachic authorities it is problematic? Well, what usually happens is that the consumer is presented with a choice. For example, when it comes to arba minim, there are a range of different options available. Some are only kosher according to some opinions, and are cheaper. Others are more mehudar and more expensive. In contemporary Orthodox and especially charedi society, there is an emphasis on fulfilling halachah according to all opinions, and doing so in the most mehudar way, even if it costs more money. Seeing that many people are fastidious to meticulously fulfill halachah according to all opinions, such punctiliousness should surely also apply to the laws of tzaar baalei chayim. That is to say, since there are opinions which state that the financial benefits such as those enabled through factory farming do not justify the suffering thereby caused to animals, those who are meticulous to follow all opinions should refrain from consuming animals farmed in such a manner. Furthermore, even if there is no technical infringement of the laws of tzaar baalei chaim, can anyone really argue that it is perfectly fine? Rav Melamed discusses the topic of hens that are starved in order to then make them enter a new cycle of laying eggs. He quotes none other than Rav Yitzchak Weiss - of Manchester and then of the Edah Charedis - who says that even though there is no technical problem of tzaar baalei chaim here, someone who wants to conduct himself via middas chassidus will refrain from this. Do people who are careful to eat Badatz Eidah Charedis today ever demonstrate care about such things? At this stage, I don't think that it's viable to say that it is forbidden to eat factory farmed chickens. I ate one today myself. But how is that virtually nobody cares about having a different option available? How is it that while you can find frum communities being careful to observe all kinds of stringencies, even those with a very shaky basis, and even those which are expensive, and yet there is no mehadrin option for chicken in terms of tzaar baalei chaim? In future posts, I plan to discuss some efforts that have been made in this direction - some of which are commendable, and others of which are problematic. But certainly, any God-fearing Jew who prides him/herself on trembling before the word of God, should ask him/herself whether it wouldn't be worth spending a little more on eating food that hasn't involved great suffering to God's creations. > But does the economic benefit of cheaper chickens count as sufficient reason to cause them great pain? I wouldn't limit it to an economic benefit. It is a virtual certainty that the selective breeding of animals to provide fast and cheap nutrition for human beings has saved millions of lives from starvation. For sure. But that's not relevant to the average frum consumer. I would question that statement. Factory farming is mostly a product of recent times in the developed world, not in places where starvation was common. Modern plant biotechnology has played more of a role. I disagree that lives have been saved by producing chickens inexpensively, as (1) much grain that could have been fed to people is used to fatten the chickens, and (2) the eating of chickens and other animal foods is a major contributor to many life threatening diseases and to climate change, which causes the loss of many lives annually through wildfires, droughts, severe storms, and floods, and other climate events. I have a friend who is almost vegetarian, a few times a year (normally Yom Tov) he eats beef from a farm in the north (Golan I think), that treat their cows humanly and the beef from there is considerably more expensive, but he says halachicly he doesn't feel it right to eat regular meat because of the Tzar ba'al Chayim issues you raised. Eating cows treated humanly....could we ask for more than that? Surely, if you are 'frum', then the feelings of the cow don't come into it directly. What matters is that by treating the cow better, then you yourself are doing all you can to fulfill the dictates of G-d. There are many additional reasons for refraining from eating meat and other animal products: many life threatening diseases are caused or worsened by eating these foods; producing them contributes greatly to climate change and other environmental threats to humanity and is very wasteful of water, energy, and grain. SuperMeat, an Israeli startup which aims to have artificial meat ready for sale in 5 years, is still fundraising. This is already here - and it tastes good as well. While that is a positive development, it's not the same thing at all. The balance of amino acids in wheat and the other vegetable ingredients is significantly different from that found in muscle tissue. 10g of vegetable protein is not equivalent to 10g of meat protein. This is an organic farm raising chickens and producing Badatz meat in a respectful way for the animals : http://www.organinet.co.il/products.html# . As far as I'm concerned, I am increasingly disturbed by the kasherut of meat because of the issues you raised. It is now well known that in Western countries, we eat too much meat and we could easily reduce our consumption by 2, or even replace meat by vegetal proteins, without any harm for our health. So I think the argument of the benefits of industrial meat is shaky (at least for Western countries). I gave up meat two years ago for health reasons. Replaced with cookies and cakes. Feeling better. Doesn't the beak surgery actually prevent them from harming other chicken? Or is that just industry talk? And supposedly the beak surgery is painless, or so they claim. We used a type of scissors to cut off the top part. Maybe it's like trimming nails because there might not be nerves in that part. I think people who would in theory agree with you are somewhat skeptical because this cause generally comes from the Left, and many frum people simply don't trust the Left for a variety of reasons. If everything you're saying is true, it's very disturbing. But is it true? And if it is, how comes there aren't laws against it in the United States where the media is controlled by Leftists? How come there isn't even a mainstream left-wing campaign against it? Maybe therefore it's not true. Or maybe there's no realistic alternative, as disturbing as that thought is. Anyways, just some thoughts. In theory, I'm totally on board. I've often wondered if right-wingers know just how blindingly stupid they sound when they use the term 'Leftists'? In the US, there are in fact 2 options for the kosher consumer who is interested in "mehadrin" animal welfare: https://www.kolfoods.com/ and http://growandbehold.com/ . Here is a third option if you live in Clevland and it sounds a lot healthier than than the factory farmed frankenchickens. If your looking for a cheaper option then check out Empire Chicken's website. I just looked into it they seem very concerned about animal welfare as well as treating their workers right. The thing about chumros is that they need a context. For example, a person who davens vasikin every day. He wants to ensure his prayers are pure, his kavana is only for the avoda of tefilla, not to get out early. This person feels that by getting up in the darkness and davening at the first opportunity, he is awakening his own feelings to the importance of davening. A person who spends more money on his lulav. He is trying to take his aseres yemei teshuva seriously, he is trying to make the yomtov of sukkos a meaningful one. Tzaar baalei chaim would make sense if the consumer would actually be the one committing it. Machmirim would be more careful. But in this case, paying extra for a product that he does not see the benefits of, does not have the same context as privately shechted beef, black matzos on Pesach, extra large tallis kotons and paying a worker extra and on time even if he was hired through a shliach. That's a new branch of Judaism. It's called 'self-centered Orthodoxy'. But you can re-frame your argument that these think the midot stairway gets you higher & those think the chumrot stairway gets you higher. So everyone is equally selfish. In any event, you touch on a fundamental question, does the idea of reward diminish the altruism of mitzvot? Like other fundamental questions, they are addressed in the classical sources - Hassidim and Mitnagdim following divergent perspectives. This isn't about mitzvos, this is about chumros. Which chumros to adopt should be based on what gets you further in your avodas hashem. @ דברים בעלמא, if you're talking to me, chumros or mitzvos, avodas hashem or lehisaneg al hashem, it all boils down to the same idea. https://www.artzenu.co.il/. They sell free range poultry, beef and lamb with an excellent hechsheir. Chicken is expensive. Chickens are poorly treated just prior to being killed - heavy bruises are common, and broken legs are not uncommon. Both of these problems would be solved to a large degree if chickens carrying these signs were deemed treifa! R. Slifkin's argument leads toward vegetarianism. Just _toward_ vegetarianism; it doesn't cross the threshold. There are long-standing "animal welfare" problems with the milk and veal industries, which are linked together. The increasing amount of milk produced by an average milk cow, over several decades, would probably track the increasing weight of broiler chickens. The life of a veal calf has no relationship to what God intended. Reminds of the discussion on this during the Rubashkin scandal back in the day. On one hand you had lots of folks pointing out how cruelly his factory treated both the animals and many of the workers. On the other you had the Agudah's PR folks saying "Look, the shechita is done in the most machmir fashion and that's all that matters" justifying why the food was kosher. I would question that comment. Any libeling of Rubashkin's was part of the UFCW corporate campaign designed to force Rubashkin into allowing that union control of the workforce. Means nothing more than a poltical attack ad. And I don't believe the Agudah ever made any such statement. Yehudah, I think you're right that people are skeptical towards this topic because they are defining themselves against the left, or more specifically animal rights activists. These are definitely real and valid issues. There are in fact big campaigns by left-wingers in the US and elsewhere. They are not that visible in the media because most of the left doesn't care about this issue very much. You don't see stricter policies enacted because, well, the left isn't really in charge in America, at least when it comes to anything that would decrease big corporations' profit margins. Rabbi Dovid Sears has an excellent book, Vision of Eden, with a lot of interesting material about Jewish sources on animal welfare issues. Ideally, government regulations would outlaw the most painful and inhumane practices (like certain veal-related practices, which I think some rabbis, like R' Feinstein, forbade), while hechshers would be available that provide chumras to ensure suffering is minimized. If we all abided by the Gemara's advice to only eat meat about once a week, the overall scale of the suffering would also be greatly diminished. Government regulation banning the worse practices, and hechshers requring chumras, would increase the price of meat further, making it more likely people with reduce meat consumption. Fascinating. This post is a textbook example of the truism that as one moves away from traditional religion, he invariably moves to fill the void with the modern liberal religion. Your current focus on animal cruelty, rather than on classical concerns of Kashrus, is perfectly concomitant with your odyssey away from charedism. The lack of concern around actual animal cruelty (in the Haredi and wider Orthodoxy as well) is also perhaps indicative of a move away from actual 'traditional' Jewish norms of morality to a focus on technical fulfilment that degrades the essence of our faith. In what world is moving away from Charedism moving away from "traditional religion"? In truth, it is Charedim who have abandoned any semblance of normalcy or tradition when it comes to religion. About the truism, there's a similar one, that as a person emphasizes one area of religion, there is a tendency to de-emphasize another. As nature [& religion] abhor a vacuum, so too they abhor supersaturation; they max out. That's why a person has to carefully choose his area of emphasis. It might come at the expense of something else. And it might not be worth it. Charedism is not traditional religion. The point is the move from right to left. Don't get hung up on labels. "Right" and "Left" are themselves labels. "Chareidism" is a label which you used in your initial comment. Your initial comment was steeped in judgment of Rabbi Slifkin, made assumptions on his movement toward your clearly despised label of what you call “modern liberal religion” as well as claim “truisms” that are mere claims. One would hope that social scientists are a lot more objective when setting out to scientifically prove to their “textbook examples”. the point is that you are moving and R. Slifkin isn't. Michapeset - to focus on cruelty to animals, real or imagined, is clearly identified with the left, regardless of the concept being in the Torah. To focus on what RNS calls "technical kashrus issues" is clearly identified with the right, regardless of how many on the left do or do not keep kosher. RNS's personal odyssey, away from the right and closer to the left, is perfectly inline with his kashrus concerns now mentioned, and a classic example of the truism I mentioned. That you somehow manage to see a judgment in that observation is reflective upon you, but not an accurate read. People are obsessed with keeping Glatt kosher or Beit Yosef, but they don't care about things that really matter. Chassid Shoteh. Is that really true - Glatt is machloket Rema vs Shulchan Aruch, according to whom is eating an animal that was subject to Tza'ar Ba'alei Chaim assur? The eating per se is not the issue. If you buy it, then you pay for its mistreatment. And the hechsher says "go ahead". But as far as the comparison, keeping Glatt is an actual [canonized?] issur while eating an animal that was subject to Tza'ar Ba'alei Chaim is for most people at most an unwitting grama of a possible one. The Frum world on the whole honestly seems to have a very poor relationship with animals on the whole. Extremely few own pets; others are downright fearful of them. I know fellows who run to the other side of the street when they see someone walking their dog on the same sidewalk. Much as so much racism is endemic to a lack of interaction with other groups, I wonder how much this fear and lack of concern for animals can be attributed to never interacting with or caring for another living thing which is not a person? How much lack of empathy do we have simply because the treatment of these animals goes on behind closed doors? "But this is not how God/nature designed chickens to develop; it does not allow their bodies to develop properly. 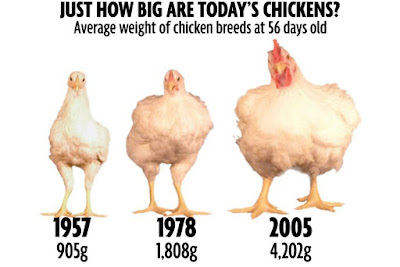 If humans grew as fat as fast as a modern chicken, a 6.6 pound human baby would, in two months, reach a weight of 660 pounds!" 1- Very poorly phrased. Perhaps "But this is not how G-d designed nature to cause how chickens develop." But G-d is not nature (Spinoza) nor is there any question whether G-d or nature did the designing. If they were aware, certain parties would love to spread this latest "proof" of your "kefirah". 2- But the way chickens were designed to develop is also not the same as a human's. If nothing else, they are supposed to grow to full size much faster. Your second statement unrealistically exaggerates the problem. Tzaar baalei chaim has a very low threshold of utility justifying a lot of animal suffering. One can discuss whether foie gras or white veal to the extents they are taken today means that the bird/calf is too likely a tereifah for us to treat the result as kosher. But in terms of the suffering... both have a long history of being permitted despite the fact that even before factory farming, both required suffering animals. As long as there is utility. IMHO, the implication is that it is not a prohibition against animal suffering as much as a prohibition against being cruel to animals. Any other motive will do. The questions of whether animals or birds are capable of meta-cognizance despite the lack of the forebrain regions we use for the job, as well as the question of whether pain qualifies as suffering without metacognizance will be left open. But my own opinion is no and no: Animals are incapable of thinking about their own pain (lacking a "ruach memalela", an internal mental dialog) and thus their pain doesn't cause a correlate to human suffering. Thus the lenient nature of tzaar baalei chaim. As the gemara says, the laws of how to slaughter an animal don't matter to G-d, they are laws for us -- per the Ramban, for human development. Tzaar baalei chaim is learning not to overcome natural empathy, even though the notion of animal suffering is an anthropomorphication. It's not the right vs the left that's the central issue; it's whether we get our values from either or use the Torah's statements and implications about values to decide what to learn from the outside and what not. I think this article reduces the distinction between animal and man to something less than our mesorah does.
" But my own opinion is no and no: Animals are incapable of thinking about their own pain (lacking a "ruach memalela", an internal mental dialog) and thus their pain doesn't cause a correlate to human suffering." Most people who have lived with a dog, or a cat, see daily evidence that those animals _do_ have an "internal mental dialog". It is convenient for us humans, to believe that something makes _our_ suffering different _in kind_ from the suffering of animals. It lets us cause them pain, with a clear conscience. I own two dogs and a cat. AND, one of the dogs is a service dog, a companion for my son who has Downs, as well as that son's diabetes support. (The dog will wake us if my son's blood sugar goes off too far.) I am not sure how one can know from watching from the outside whether an animal is capable of thinking about its own thoughts. We do know that they lack the brain structures we use for doing that trick. And, we have reason from Chazal to believe that we alone have what it takes to have that running monologue. So, while we often attribute metacognizance to animals, there is little reason to believe it's much different than when discussing a computer program and the natural description is to say it "wants" to do something. I cannot describe what it is to experience something but not experience the experiencing of it. As people, we call such experiences unconconscious. A human too can do pretty complex things unconsciously, subconsciously, preconsciously, etc... By definition we can't discuss here what they're like. Because the second we discuss, we're going meta and can only be dealing with experiences were were meta-cognizant of. But I am sure that if where were some surgery that required you weren't fully anesthetized, and the only usable anesthetic was one that still allowed pain to reach the subconscious, that your body would need to be restrained from responding, any of would prefer that than being aware of being aware of being in pain. Pain without metacognizance doesn't produce the kind of experience we usually mean by the word "suffering". So, if the Torah permits some kind of tzaar baalei chaim on what seems to us to be pretty flimsy grounds, perhaps we are over-trusting our instinct to anthropomorphize creatures that look like us and have complex responses. Perhaps this is even morally negative; perhaps we are viewing the world in a way that places animals and people on a more equal footing than Hashem desires of us. I'm one of them. My wife used to laugh at me, then one day whilst carrying a week old baby she asked a man with a St. Bernard for directions and the dog mauled her foot disabling her for two weeks and requiring daily intravenous antibiotics. ואמרו חכמים ארור מגדל כלבים וחזירים, מפני שהיזקן מרובה ומצוי. A usual, you are stupid. I don't know about you, but when I see lightning I keep my distance from metal, when I see scalding water withdraw my hand, when it's 40 degree I go inside and when I see a big dog being led around by a cretin who can't tell the difference between the Siberian tundra and a street in Yerushalyaim, I cross the road. Anyway, the damage caused by the nasty gentile custom of owning dogs goes farther than children having their face bitten off. I'm not saying that you shouldn't cross the street if that is your thing. Instead you take your preconceived notion and then hang it on the nearest Rambam and tell everyone else that they are following the gentiles. You do know that dogs were domesticated by people from wolves way before Matan Torah so that the idea of calling dog ownership a Gentile custom is absurd. You presumably also know that dogs are now vaccinated for rabies so that risk of being injured by a mad dog is many times less then it was at the time of the Rambam (and there is a way to keep the person alive even if they were bitten). You do know that dogs were domesticated by people from wolves way before Matan Torah so that the idea of calling dog ownership a Gentile custom is absurd. What's up with you today? Why would something preceding matan torah disqualify it as a gentile custom? You presumably also know that dogs are now vaccinated for rabies so that risk of being injured by a mad dog is many times less then it was at the time of the Rambam (and there is a way to keep the person alive even if they were bitten). 800,000 people in the U.S. every day receive medical treatment for dog bites. All so people can have imaginary friends. The Rambam isn't talking about people dying of rabies (pigs, by the by, don't have rabies. I'm not the first. Check out the Ya'abetz. What do you think when you read Devarim 28:9. Just as the net benefit of stairs outweighs the costs, so too the net benefit of dogs may outweigh the costs. Except for blind people and certain autistics, dog ownership in urban environments has no 'benefits', unless having poo everywhere counts as a benefit. Gavriel M. Please site your source for 800,000 people a day. Is that in the world, the US, etc? Here in the US, I give 800,000 imaginary friends medical treatment for dog bites every day. Because there were no B'nei Yisrael and therefore no Gentiles back then? 800,000 people in the U.S. every day receive medical treatment for dog bites. All so people can have imaginary friends. I get it. You don't like dogs and don't see the value. So don't have one and cross the street when they are there. That likely drives your risk down to close to 0 (in modern times with leash laws and such). Others like dogs. They formed a significant part of their childhood and family life. They also provide a level of protection (an idea which the Rambam endorses). [I know that I am sinning by living in the US, but over here, there are women who do not feel safe walking the streets without a dog.] They take a risk just as some take a risk to live more cheaply in a given area with stairs in their house. The Rambam isn't talking about people dying of rabies (pigs, by the by, don't have rabies. On that Rambam; he says that it is prohibited to raise dogs that are not chained. He says that if they are chained during the day that they can be let loose at night to protect the area. So he allows for a beneficial protective effect. He then quotes Chazal that one is cursed who raises pigs or dogs because of the damage they do. I don't know what pigs do to be dangerous, but rabid dogs were definitely a problem until recent times. I'm not sure why you think that dogs and pigs must present the same danger or that rabid dogs were excluded from the danger he was talking about. Frankly I'm surprised to hear you analyze the Rambam in such a simplistic and uncontextualized fashion. He was certainly referring to some dangers related to dogs which may or may not apply today. You can argue that they do, despite the fact that dogs are likely much safer, but I'm surprised that you deny that this should be part of the analysis. Either way, even that Rambam talks about balancing costs and benefits. Keeping a dog inside the house and leashed when outside especially for the purposes of protection seems to fall squarely within the Rambam's permitted uses. Please site your source for 800,000 people a day. Is that in the world, the US, etc? Dog people are remarkably fond of saying that nothing proves anything. What do you think when you read Devarim 28:9. ט יְקִימְךָ יְהוָה לוֹ לְעַם קָדוֹשׁ, כַּאֲשֶׁר נִשְׁבַּע-לָךְ: כִּי תִשְׁמֹר, אֶת-מִצְו‍ֹת יְהוָה אֱלֹהֶיךָ, וְהָלַכְתָּ, בִּדְרָכָיו. 9 The LORD will establish thee for a holy people unto Himself, as He hath sworn unto thee; if thou shalt keep the commandments of the LORD thy God, and walk in His ways. Don't see any references to dogs in there. Are you arguing that just as God has no pets, we should also have no pets? Oops. that was a worse than usual mistake. I meant 23:19. לֹא-תָבִיא אֶתְנַן זוֹנָה וּמְחִיר כֶּלֶב, בֵּית יְהוָה אֱלֹהֶיךָ--לְכָל-נֶדֶר: כִּי תוֹעֲבַת יְהוָה אֱלֹהֶיךָ, גַּם-שְׁנֵיהֶם. I've asked a few people why they think that Moshe calls money procured by selling dogs an abomination, but I've never got a sensible answer. What goes around comes around. If you treat the animals you eat with cruelty and grow them unnaturally it will only come back to bite you in the hindquarters. There are many health problems associated with modern mass production food methods and not only with animals but with all aspects of the food supply. Think about what might be the difference between a chicken that is allowed to eat grass and bugs, and is allowed to roam outside in the sunlight as opposed to a chicken that is cooped up and fed genetically modified Glyphosate infused soy and cornmeal together with various growth hormones and vaccines - yes they vaccinate chickens. Think about a chicken that experiences severe stress prior to slaughter and produces a slew of fight or flight hormones like cortisol which you will now ingest. How many readers know that regular kosher and nonkosher chickens have to be rinsed in chlorine baths to disinfect them.Pasture raised chickens do not require this disinfection protocol.Unfortunately,Rabbi Dr Slifkin has turned what is a scientific and health issue, into another Left wing politically inspired religious attack on Charedim. He as well as most of the commenters, as well as the charedi and non charedi public are missing the bigger picture. This is surprising because based on Rabbi Slifkins backround with animals and nature one would expect him to be more fully informed on these issues. There are alternatives available. For example, Yehoshua Tibor's fresh meat coop in Israel (Artzeinu meats). Furthermore, I think it's disingenuous to imply that everyone who eats the eida cares nothing for tzaar baale hayim. I'm sure some do. That article is about the death of the chicken, not so much about its life. It all starts with breeding. While companies like Purdue may breed chickens for large breasts because breast meat is in highest demand, Empire’s chickens are bred for kashrut. That means large breasts could add weight that damages the chicken’s tendons, rendering the chickens treif, or unkosher, when slaughtered. No growth hormones are administered; hormone use for poultry is illegal in the United States. At Empire’s hatchery, the temperature, humidity and duration of incubation is strictly calibrated to ensure maximum yield. Eggs are turned every hour on the hour to keep the chicks inside from sticking to the eggshells. Once the eggs hatch — 82 percent will — the chicks are inoculated against avian sicknesses such as Marek’s disease and coccidian before being trucked to farms spread out over five Pennsylvania counties, all within 90 miles of the Mifflintown plant. Area farmers raise the chickens, but Empire dictates and remotely monitors how the chickens are housed and provides all the feed. It takes approximately 1.8 pounds of feed — mostly corn, but also some soy meal and other ingredients — to grow a pound of chicken. The birds’ diet is strictly vegetarian and kosher for Passover all year round." 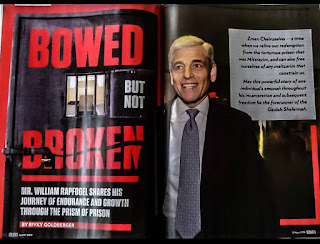 Also this, from their website: "Empire Kosher cares deeply about animal welfare, with all poultry humanely raised by a network of small family farmers, for whom animal welfare is espoused and embraced. The stress free chickens roam freely and are sheltered in spacious, sanitary quarters, instead of in chicken coops. Their wings and beaks are never clipped and they are fed Empire Kosher’s own 100% vegetarian feed, made to a unique and exacting formula. All are antibiotic free, with no growth hormones ever added." Thanks for posting this! And they also treat their workers well: health, dental, vision. maybe it was the same article that the head of the union was quoted as saying that the workers at empire are treated much better than most places. I've always felt bad that I couldn't afford to buy from the small farms that produce free range, well treated etc. but after seeing this about empire I am very impressed especially because their prices are normal. Its very heartening that empire has gone to these lengths. As I said, mass produced chickens including Empire brand chickens are fed corn and soy concoctions. The vast majority of the soy and corn in the US is genetically modified Roundup brand from your friends at Monsanto Bayer, which contains Glyphosate residue and G-d Knows what else. Besides being a likely carcinogen,Glyphosate has been linked to the Autism epidemic through synergistic toxicity with vaccine components. See https://worldmercuryproject.org/news/weeding-vaccine-toxins-mmr-glyphosate-health-generation/ Lord only knows what effect the various chicken vaccines have on human health. One thing is certain chicken vaccines are very healthy for the bottom line of the companies that sell them. Wow, we're still feeling the effects of the posts on medical pseudo-science in the comments section. Perhaps we should all re-read "Rabchick -- a Jewish Dog", by Sholom Aleichem. As I remember it, the story suggests that not _all_ dogs are Jewish, but some dogs are. "Roasted Pork Loin" is unlikely to gain you any fans on this page.